Cetis Report , serial number: 2014:R02. Since its establishment in 2011, the Learning Resource Metadata Initiative (LRMI) has aimed to make it easier to publish, discover, and deliver quality educational resources on the web. From 2011 to 2014 the initiative was co-led by the Association of Educational Publishers (AEP) – the 501(c)(3) division of the Association of American Publishers, and Creative Commons, and funded in three phases by the Bill & Melinda Gates Foundation. In October 2014 the leadership and governance of LRMI passed to the Dublin Core Metadata Initiative, a long-established metadata community with expertise in metadata design, implementation and best practice. Cetis Report , serial number: 2014:R01. The New Subject Coding System project was commissioned by HEDIIP (the Higher Education Data & Information Improvement Programme) to develop a replacement to JACS for classifying the subjects of courses offered in UK Higher Education. Cetis (assisted by Alan Paull Services Ltd) were engaged to undertake stage 1 of the project, which involved extensive stakeholder engagement examining the requirements and impact relating to a new subject coding scheme. The findings of this work are presented in this report. a subject coding framework be developed alongside a specific core scheme. Cetis Briefing Paper , serial number: 2014:B01. Schema.org is a joint initiative of the search engines Google, Bing, Yahoo and Yandex aimed at making it easier to index web pages in such a way that facilitates the building of sophisticated search services. Schema.org metadata may also be used for other applications e.g. in eBooks and as stand-alone metadata records. This briefing describes schema.org for a technical audience. It is aimed at people who may want to implement schema.org markup in websites or other tools they build but who wish to know more about the technical approach behind schema.org and how to implement it. We also hope that this briefing will be useful to those who are evaluating whether to implement schema.org to meet the requirements of their own organization. This briefing has been produced as part of the Learning Resource Metadata Initiative (LRMI), which is concerned with extending and applying schema.org to the description of educationally relevant properties of resources. Other briefings in this series will provide an in-depth overview of LRMI. Learning Resource Metadata Initiative: using schema.org to describe open educational resources. Cetis Other Publication , serial number: 2014:X01. Link: Learning Resource Metadata Initiative: using schema.org to describe open educational resources (PDF). This paper, presented at the Open CourseWare Consortium Global Conference in Ljubljana in April 2014, discusses the Learning Resource Metadata Initiative (LRMI), an international project that aims to facilitate the discovery of educational resources through the use of embedded metadata that can be used by search engines (e.g. Google, Yahoo, Bing, Yandex) to refine the search services they offer. LRMI has extended the schema.org metadata vocabulary with terms that are specifically relevant to aiding the discovery of learning resources. In order to understand LRMI metadata it is necessary to first introduce schema.org metadata. LRMI was later funded to assist a number of services providing open educational resources in modifying their display interfaces so that they included relevant embedded metadata. In addition to synthesizing the lessons learned from these implementations, the current phase of the LRMI project is engaging with potential users, including search providers and learning resource developers, with the aim of extending the uptake and implementation of the specification. Also available: video and slides of presentation from conference web site. Cetis White Paper , serial number: 2014:WP01. Cetis White Paper , serial number: 2013:WP03. Link: Survey of the State of Analytics in UK Higher and Further Institutions 2013 (pdf). 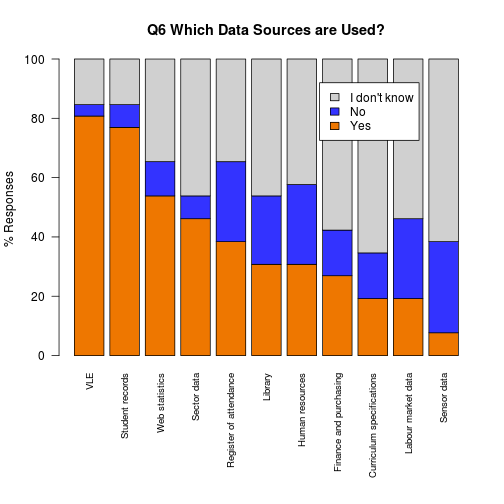 Link: Survey of the State of Analytics in UK Higher and Further Institutions 2013 (MS Word docx). Cetis White Paper , serial number: 2013:WP02. Cetis Other Publication , serial number: 2013:X02. This background paper presents executive summaries and links to key documents and publications relating to all aspects of openness in education. Cetis Briefing Paper , serial number: 2013:B01. This briefing introduces a range of approaches and specifications for recording and exchanging data generated by the interactions of users with resources. Such data is a form of Activity Data, which can be defined as “the record of any user action that can be logged on a computer”. 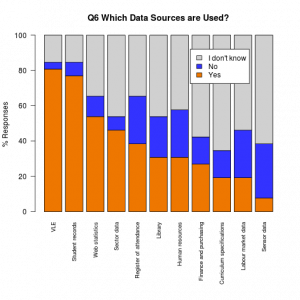 Meaning can be derived from Activity Data by querying it to reveal patterns and context, this is often referred to as Analytics. Activity Data can be shared as an Activity Stream, a list of recent activities performed by an individual. Initiatives such as OpenSocial, ActivityStreams and TinCan API have produced specifications and APIs to share Activity Data across platforms and applications. While Activity Streams record the actions of individual users and their interactions with multiple resources and services, other specifications have been developed to record the actions of multiple users on individual resources. This data about how and in what context resources are used is often referred to as Paradata. 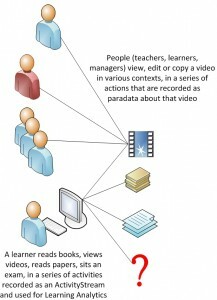 A specification for recording and exchanging paradata has been developed by the Learning Registry, an open source content-distribution network for storing and sharing information about learning resources. Cetis Analytics Series , serial number: ISSN 2051-9214 Vol 2, No 2. Over the past five years, as part of its overall developments in teaching and learning, The University of Huddersfield has been active in developing new approaches to assessment and feedback methodologies. This has included the implementation of related technologies such as e-submission and marking tools. In this case study Dr Cath Ellis shares with us how her interest in learning analytics began and how she and colleagues are making practical use of assessment data both for student feedback and overall course design processes.